Review by Jeremy Jowell The small Cessna banks to the left and I look out over the open expanse of the vast Savute marsh. In the distance, the twisting contours of the dried-up channel are clearly visible. Way down below, a lone elephant drinks at a waterhole.My plane swoops low and in a cloud of dust, comes in to land on the sandy runway. Munihango Limbo, a guide from Savute Safari Lodge, is waiting for me next to the landing strip. We drive through thick sand to the lodge, a luxurious camp situated on the edge of the dry Savute channel, where I'm warmly welcomed by camp managers Johan and Tanya Bruwer. 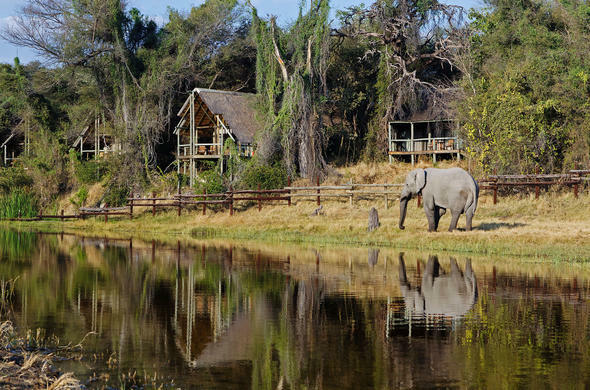 The lodge accommodates just 24 guests in beautifully finished thatched-roof chalets, each with its own lounge, en-suite bathroom and wooden veranda overlooking the waterhole where elephants are ever present. 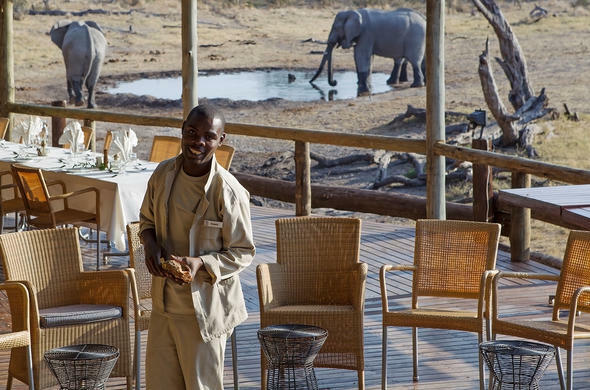 Savute is situated in the heart of Chobe National Park, one of the great game parks of Africa which stretches over 11,700 sq km, from Kasane in the north of Botswana to the edge of the delta in the south.Savute is a magical place. Just by driving past the rocky outcrops and along the magnificent marsh, or through the dry channel with its strange terrain of stunted acacia trees, one can sense the drama and death that is an eternal part of the park. 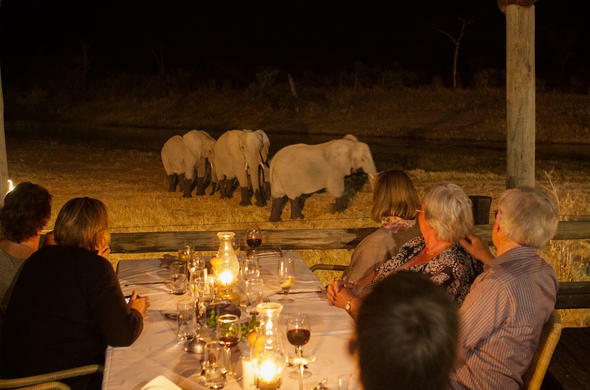 The area is famous for its elephants and the adult males often congregate in large numbers at the pump waterholes. These elephant populations are known to be mild mannered by nature, which makes for great close-up encounters. Then we continue through the Savute channel that dried up in 1982 when waters from the Linyanti River stopped flowing. Movement of the earth's tectonic plates determines when water will flow again to fill the channel and flood into the marsh. We push on through thick sand into the golden light of Africa. As the day warms up, off come the layers of clothing, and soon I'm sweating in the morning heat.The bird life is prolific and we see a wide variety of species, including the red-billed hornbill, crimson-breasted shrike, Cape turtledove, the fork-tailed drongo and Botswana's national bird, the lilac-breasted roller. Limbo is a wealth of information on the flora and fauna and often stops the vehicle to inspect animal tracks in the sand. We pass Bushman Painting Rock and he shows me Presidents Camp, a secluded area where past president of Botswana, Sir Seretse Khama, used to come and pitch his tent. 'He used to love being in nature and now his son Ian Khama, who is vice president of the country, is a wildlife enthusiast. He comes to stay at out lodge every year and I've guided him twice. Such a nice man,' says Limbo giving a big thumbs-up. We journey on through Wild Dog Vlei and stop to photograph a family of dwarf mongoose who are sunning themselves on a log. A white-backed vulture glides gracefully in the thermals above.Past Peter's Pan and Leopard Rock, we arrive at Marabou Pan where 14 bull elephants are drinking from a pump waterhole. The elephants of Savute are known to be good-natured, so I alight from the vehicle to photograph them from ground level. I crawl on the sand to just seven metres away from the amazing animals who are unconcerned by my presence and continue to drink and splash. A warthog arrives and even he doesn't mind me being around.For the next two hours, I click away at the elephants, lying amidst their dung and watching from the vehicle when we park close to their giant frames. It's silent in Savute and I can hear every sound as they slurp and swish and spray themselves with mud. Eventually I tear myself away from the spectacle and we drive back to the lodge for lunch. Meals are first class affairs and we feast on delicious pasta salad, followed by Spanish tortilla and bobotie, accompanied by freshly baked corn bread. Dinners at the lodge vary every night but some of the favourites are smoked ostrich salad, guinea fowl potjiekos, venison and seswa, a tasty traditional dish of pounded beef served with samp and beans, wild spinach and butternut. 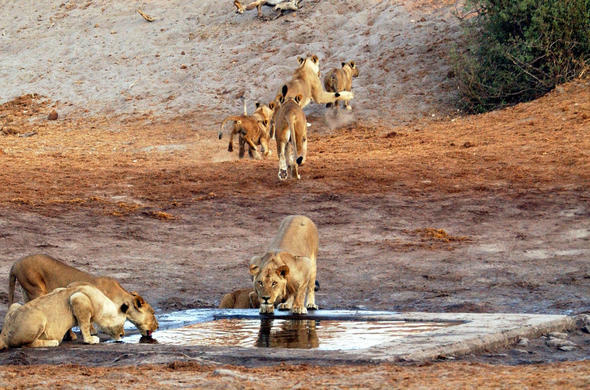 We rush over and find 14 lions, including a large male and four cubs, sleeping in the sun. They are right next to the road and I spend the next two hours watching them as they occasionally wake, groom themselves, roll over again and begin to snore. The cubs are keen to play but the adult male is not in the mood and pushes them away with his big paw.As the day heats up, one lioness stretches and walks past our open vehicle to rest in the shade of some bushes. One by one, the rest of the pride follow and I freeze as they pass just metres away. An inquisitive cub stops to sniff out bumper before moving on to join his mates. Finally, the male rises and looking directly at the car, he yawns wide, exposing his fearsome fangs and throat. Then slowly he gets to his feet and majestically walks off alone down the road. Here in Africa, the lion rules supreme.Copyright © 2003 Jeremy Jowell. All rights reserved. Reproduction in whole or in part without the permission of the author is prohibited. The elephants of Savute are known to be good-natured, so I alight from the vehicle to photograph them from ground level. I crawl on the sand to just seven metres away from the amazing animals who are unconcerned by my presence and continue to drink. Savute is a magical place. The surrounding African bush is home to a diverse eco system. 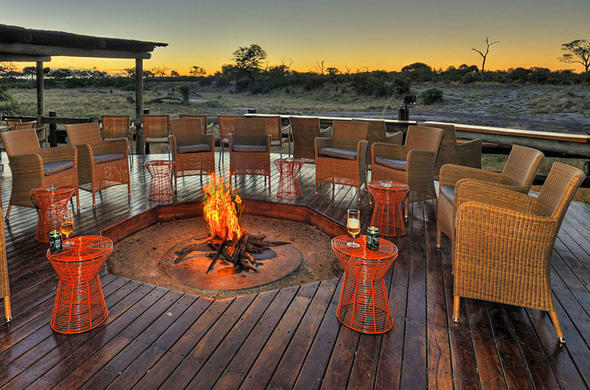 Spot Lion, Elephant and Wild Dog during your Botswana safari holiday. Dinners at the lodge vary every night but some of the favourites are smoked ostrich salad, guinea fowl potjiekos, venison and seswaa, a tasty traditional dish of pounded beef served with samp and beans, wild spinach and butternut.